You are currently browsing terrietalk’s articles. I remember this story from 3 years ago. As I continue my journey on Sugarholic Road, I thought I would share it again. This is a Friday day for me. I had two major projects to complete and, you guessed it, neither got done. One of our office computers had a Trojan virus that captured the screen and made the machine useless. Frustration Friday. Food…enjoying flavorful food is my favorite pastime when things are not going well. Chocolate. Ice cream. Candy bars. They are my comfort foods. But here we are on a crazy Friday afternoon all crunching away and determined to leave the office with a smile. This was taken 3 years ago with Merlyn (L) and Roanne. Merlyn is now the recycling coordinator in Ulster County and had a baby book in December 2017. Sorry to say that our wonderful Roanne recently died. We all loved the Chip-ins. Chips made with popcorn. That bag went fast. The Fit Sea-salt bag tasted sinfully good, with very few calories. Are you for or against common core? Readers of Hudson Valley Parent often view the Common Core articles online. It reminded me of a presentation I had to make at a PTA. What’s the best parenting advice I could offer. After all, I am a mom of two grown sons and a grandmother to 12-year-old Lia and 14-year-old Robert. And then I spotted the Pet Rock that my youngest son made for my mom. I found my mom’s Pet Rock when we were cleaning out her apartment after she died. She moved several times and Eliot’s Pet Rock always held a place of honor. Eliot had to be about seven or eight when he created his masterpiece. So now I realize that the first thing I would share with the PTA moms is that sometimes it’s the simple things you do with your kids that last a lifetime. Has nothing to do with money or time. It’s that special moment of sharing. Then I skip ahead ten years. My son was a member of a group that ran for county offices, like judges and the county executive. The video he created caused an uproar among adults but the kids loved it, and got voted into office. Like bad boys we were called into the principal’s office where we were told that Eliot could not take the judgeship for the day. My husband and I turned to my son and asked him what he would like to do. Regardless of what he decided, we would support him. This lead to me sharing my second piece of advice: as parents it is our role to support our kids so they feel comfortable standing up for themselves. Or in situations where they cannot stand up for themselves, we have to be strong advocates for them. For some parents fighting the common core battle is their way of standing up for their kids and that’s their right. But for me, it is the small acts we do all the time that help our kids grow up to be strong individuals who love life and enjoy learning no matter how old they are. We see all the studies that report about the rise of diabetes in our communities. Kids and adults alike. According to the American Diabetes Association over 29 million children and adults have diabetes. I am one of them. Several years ago, I was diagnosed with Type 2 Diabetes. Not the end of the world, but it did require attention. Diabetes is the 7th leading cause of death in the United States. In 2016, I experienced a year of good health and better blood results, but I wonder if I can continue on this path. The jury is still out. Follow me on this journey and share your thoughts on what helps you lead a better, healthier life. As a child I always loved sugar. My mom would buy a six-pack of Milky Ways, Mounds Bars or Snickers for my brother and I to have as snacks. Within a day, or maybe two, all six of the chocolate bars would be gone. “Did you eat them?” my mom asked. “Not me! Must have been my brother,” I insisted. It was the same script week after week. I love most foods but especially cookies, candy, cake and ice cream. The more the better. When I was in college, my diet consisted of the “wonderful” choices in the college dining hall: pasta and more pasta, sandwiches and tuna casseroles. You get the picture. (This was back in the 60s before food vendors were required to provide healthy options.) I attended SUNY at Albany which was in downtown Albany at the time. And they did not serve dinners on Sunday night. The kitchen staff were off, and we were on our own. With little money to spend my roommate and I would head over to Stewarts. They served ice cream sundaes with all you can eat toppings. Dinner ended up being 3 scoops of ice cream and heaps of hot fudge, marshmallow sauce and sprinkles. But all this crazy eating style never daunted me. When I choose to wear a fitted dress or tight pants for an upcoming date, I would begin an exercise regimen . You’d be surprised how sit-ups and side bends tighten your waist as well as your stomach muscles…and in a short period of time. Then I got married and at 24 and 27 I became pregnant. Who worried about anything other than getting through those nine months. I was sick most of the time and actually lost weight while continuing to satisfy my sugar cravings. After all, I was pregnant and felt I was entitled to give in to every food urge you could imagine. Now I’m in my 30s and my kids are growing up. I became a running nut. Six days a week you could find me out on the roads. That lasted about eight years, until my knees gave out. During those eight years I could eat anything and everything and still maintain a slim figure. That was a period of pure delight because I could give in to my sugar cravings and not feel the weight gain consequences. Why the emphasis on weight? According to my endocrinologist, there is a direct correlation between weight and Type 2 Diabetes. It is now 40 years later and I have permanently added 20 pounds, hence the diabetes. At the beginning of the year it was 40 pounds but I lost 30 pounds over the last 12 months. You may wonder what I think the problem is. The problem is simple. In five months I gained back 10 of the 30 pounds I lost. So the real question is, ‘what does it take for a Sugarholic to change her spots?’ After all, I could just take medication to “cure” the effects of diabetes. Or could I? Follow me on this journey and let’s see where it leads. Last night I didn’t sleep very well. I’m sure many of you know the feeling. The next morning I contemplated playing hooky. “Do what is best for you,” said my husband as he hovered over me. What is best for me? Not sure, but then I remembered that I was speaking at a PTA parent group at 10, so I’d better get moving. I walked around the apartment thinking about the best parenting advice I could share. After all, I am a mom of two grown sons and a grandmother to 12-year-old Lia and 14-year-old Robert. 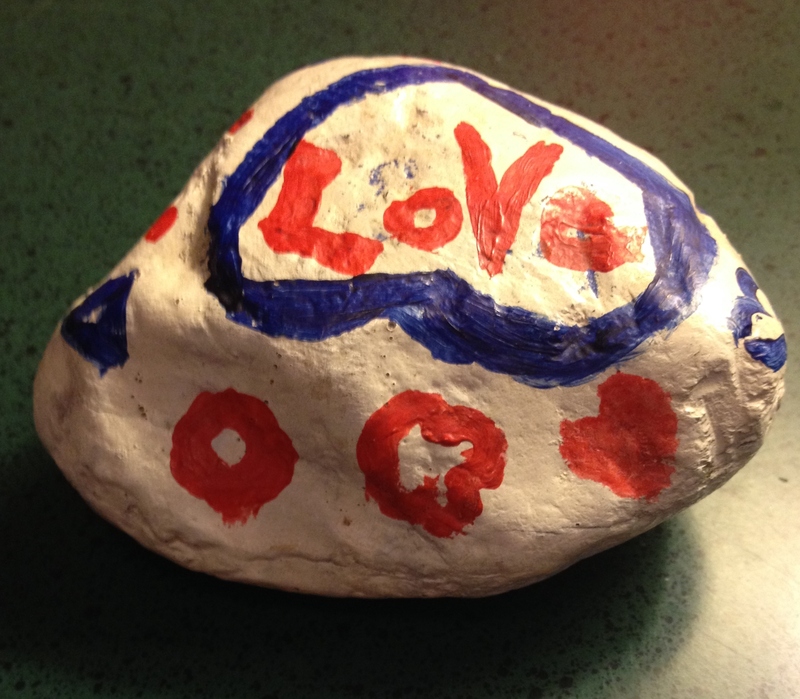 And then I spotted the Pet Rock that my youngest son made for my mom. And the Kettlecorn reminds me of a lighter Crackerjacks, except it doesn’t have a prize. According to their website Popcorn Indiana is available at locally at Price Chopper. Monster art your kids will love! A number of years ago I wrote a blog called “I found the best kept secret”. Did you know that we have a foundry right here in Orange County where world-recognized sculptors come to create their art? The foundry has been here since 1996, so they are not the new kids on the block. You can’t go into the foundry but you can enjoy the wonderful works of Frank Stella, a New York City painter and sculptor, whose works are installed in museums in from Canada to Brazil, from Washington, DC to Houston Tx. I call the scuptures Stella’s Monsters on Parade. You can view them in the fields across from the foundry and on the “porch” of the building. The wonderful thing about seeing these monsterous scuptures is that you don’t need an appointment, you don’t have to stand in line and there is no fee. Last night I said to my husband,”Let’s drive over to Polich and see what’s new.” While you can enjoy the photos I shot, make you own trip to see the wonders of Stella’s Monsters on Parade. Have you ever seen kids dance with a sad face? Lia talking to her mom on my cell phone. My granddaughter, Lia, just turned 8 on July 3rd. I remember when she was born. The doctor told my daughter-in law Caroline that she probably give birth the last week of June. I was looking forward to that hoping she would share my June 25th birthday. June 25th and 26th and 27th past and no Lia. Now I’m having a problem because my mom’s birthday is July 4th and she lives in southern New Jersey quite a distance from my kids. I had been staying close to the phone so I wouldn’t miss the call about Lia entering the world. After Caroline gave birth, Clay and I were going to take care of Robert, who was 3 at the time. Finally early on July 3rd I called my mom to say Clay and I were coming over to celebrate her birthday. You can guess what happened next. We were all at an outdoor ice cream stand laughing as we sat under some trees enjoying some cool ice cream cones when my son, Paul, called. “Mom, where are you? Meet us at the hospital.” In the car. Bring mom home and drive the I-95 corridor toward Trumbull, CT.
And she has been singing and dancing ever since. For example, the family would meet at the Danbury Mall, and when Lia was 3-years-old she would dance to the tunes coming from the free-standing ad kiosks. Shoppers would stop, smile, applaud and Lia kept dancing. This past year she joined a hip hop dance class which she loved. She would demonstrate her new moves every time we came over. “Look what I can do,” she would say with a big grin on her face. Saturday, June 8th was Lia’s big day…her dance recital at the Klein Memorial Auditorium, a beautiful Bridgeport theater. And believe it or not, this was the first time she said she didn’t want to perform. This is a girl who would dance anytime she heard a tune. Caroline encouraged her to put on her costume and just go to rehearsal, knowing that once Lia heard the music there was no stopping her. The recital was more than I expected with colorful costumes, great music and wonderful backdrops. All the kids seemed to enjoy being on stage. The auditorium was filled with parents, relatives and friends of the dancers who were all there to support the kids on stage. It’s too hot outside! How about Duck Pin Bowling? I never thought I would really welcome cooler weather. After all, as I write this column, we are only 2 weeks into summer. If you love basking in the sun then you are in seventh heaven, but I am not one who willingly sits by a pool or a lake. I live in in an old brownstone in the City of Newburgh, so other than the Newburgh waterfront where the water is not the cleanest, I have to travel for a dip in the water. And even if I was willing to travel, one hour of hot sun is about enough for me. So I ask the question: Where is a good place to hide from the sun that would be fun for the rest of the family? At this stage my grandkids would willingly play with their game tablets, while lying in bed. Or choose to plop themselves down in front of their large screen TV. I’m sure you get the picture. A duckpin bowling alley is similar to the regular bowling alleys we have locally but the pins are smaller and so are the balls, which are slightly larger than a softball and they don’t have finger holes. What’s so great about this? First of all, I love the lighter balls. They are easier for me to handle. Second, everyone can play regardless of their skill. When I went with my grandson there was a little fella who was about 3 years old was playing next to us and having a grand old time. And third, since we don’t have any local lanes, this is a novelty sport for my family, where we laugh and have have fun. Here’s my family-friendly day trip: head over to Danbury, CT.
Go early and have a fun day of shopping at the Danbury Fair Mall. My kids and grandkids enjoy the new Microsoft store and I have to admit so do I. Check out their daily calendar of events to see what’s new that your kids will enjoy. I try all the gadgets I can get my hands on and the staff are really tolerent of my simplistic questions. The store has plenty of demo machines plus they have kid’s games on a large screen in the back of the store and there are two kiosks outside the store with Xbox games and entertainment. Last time we went, my granddaughter loved learning the dance routines while she earned points. Ready to eat? Take a short drive, maybe 10 minutes, to Stanziatos Wood Fired Pizza for an dinner. Go early. It’s a popular place that fills up quickly. The first time we went we got there at 6pm and were disappointed when we learned there was over an hour wait. I don’t know about your family, but we are not good at standing around. The next time we got there at 5pm, and the service and food were great. Note: they are not open on Sundays. With great shopping under your belt and a full stomach, it’s now time to try your skills at the Danbury Duck Pin Alley, which is maybe 15 minutes from your restaurant. The alley is a family-owned business that has been around for 40 years and they are definitely family-friendly. Take pictures if you go and post them on Hudson Valley Parent’s facebook page. Love to see them! My son Paul show off his creative bowling move. My grandson, Robert, graduated from 5th grade. For him it’s a big deal because he leaves the Jane Ryan Elementary School to enter middle school. As part of the moving up ceremonies, the school organizes a full-fledged graduation and a very special spring concert which includes performances by the string band and their regular band plus a choral concert with the entire 5th grade…about 65 kids, doing some rousing singing. Many kids, including my grandson, got to do a solo. Some of the kids introduced the songs, some sang a short intro at the beginning of a piece, and others brought their instruments to accompany the chorus. We watched 10 and 11 year olds show a wonderful stage presence before a packed house of friends, other students, parents, grandparents and other relatives. What a shame that when schools think of cutting their budgets it is the arts that get slashed without much thought or guilt. I have seen my grand-kids learn so much through the arts…about social studies, about writing and reading, and about the community in which they live. And about life. The 94-year-old Pete Seeger uses his folk singing style to make strong points the lives we live including our role in cleaning up the Hudson River and about making peace rather than war. I saw him perform at this year’s 35th Annual Clearwater Festival. Have you ever watched Fringe, the series that Fox premiered in 2008? Fun to watch, especially seeing Walter, the slightly crazy genius Dad. All Walter’s craziness aside, he had great insight. Music gives us a reason to live…probably not a direct quote but you get my gist. Are you an Activist at heart? I feel strongly about our kids needing a good education. I hate the back stabbing that goes on in politics. And I think that the rich are getting richer as most of us struggle to meet our daily bills. But I am never sure how to make a difference. Do you describe yourself as an activist? Where do you think you can make a difference.? The 94-year-old Pete Seeger has made being an activist an art. I saw him perform at this year’s Clearwater Festival. Those of us at Hudson Valley Parent attended the Clearwater Festival in Croton-on-Hudson on behalf of MyFamilyTripPlanner. It was a first time for me and, boy, was I overwhelmed. But at the core this festival is an activist’s haven. All the paper and plastics in the food court had to be recyclable. I ordered a large iced coffee. It came with no top. Why? Because the tops that came with this cup did not meet the Clearwater’s recycling standards. My staff bought some crafts made by women from Nigeria. The vendor comes here for short periods of time to sell the crafts before she returns home. All the money supports a woman’s collective and the money also helps send their children to school. And the music. I must admit I didn’t know many of the performers, but Buffy Sainte-Marie had the audience standing as she sang about her Indian heritage. Most singers belted their messages through song. Around 3pm on Sunday, one dad visited our booth as a group performed next to us. “I think I’ve heard ‘turn, turn, turn’ about 35 times this weekend,” he lamented. Besides food, music and crafts, there were the activists. Everywhere I went I met people carrying signs. They stopped me to ask if I would sign their petitions: GE and the PCB clean-up. Nuclear plant in Buchanan. Going solar at home. Eventually I found the section of the festival called ACTIVITISTS” Don’t Move Firewood”, “May Peace Prevail on Earth”, “Moms Demand Action”, “Save Our Schools”, “Combat Paper NJ”, “NY for Women’s Equality”…those are just my first five cards. I have 25 cards in all. In the coming days I will write about some of the groups I met. If they of interest to you, you can follow up. I am also going to decide what means the most to me and see where I think I can make a difference.